Revenge is on the mind of many Algerians. The north Africans are intent on making Germany pay for one of the shadier moments in World Cup history. Algeria were eliminated from the 1982 finals in Spain in controversial fashion as West Germany beat Austria 1-0 in the final group game - a result that sent the European neighbours through at the expense of the African underdogs. Now, 32 years after the 'Disgrace in Gijon', Algeria face the Germans again - on the back of creating history. The 2014 World Cup is the first at which more than one African nation has made it past the group phase, with Nigeria facing a fearsome-looking France side in Brasilia in the day's other last-16 match. Today at the World Cup tells you everything you need to know, from who you can expect to win and which players to watch out for, to how to ensure you do not miss any of the action. Who is playing - and who will win? Mark Lawrenson: "This is the biggest test so far for France but they look to be in pretty good shape after getting through the group stage so easily. "France have got goals in them but Nigeria showed against Argentina that they are dangerous going forward as well. "Nigeria are direct and play to their strengths but they are too inconsistent for me and, although I am expecting a close game, I would back France to sneak through." Mark Lawrenson: "Germany have got such a strong squad, they can bring people on to change the direction of a game. "Algeria have done fantastically well to get this far - you saw that in their celebrations when they got the draw they needed with Russia to progress to the knockout stage for the first time. "I cannot see them beating Germany but they will have a go and they will try to play as well - credit to them that they did not kick their way out of their group or park the bus." History could be made in Porto Alegre in Monday's second match. Germany forward Miroslav Klose is level with Brazil legend Ronaldo on 15 World Cup goals after scoring in the 2-2 draw with Ghana in the group stages, and this may be the 36-year-old's last chance to claim that record outright. This is the fourth World Cup Klose has played in. He scored five times in both 2002 and 2006, and netted four goals in South Africa in 2010. He was not used in Germany's 4-0 win against Portugal, but came on in both of Germany's last two matches. Klose is the oldest player in the German squad but often the man they turn to if they need a goal - so could play a decisive role in this last-16 tie. "It's sensational for me to have this kind of player on the bench knowing they can make a decisive move." "He runs a lot and has played very well. I hope he scores lots of goals for us and takes the Golden Boot home." France scored eight times in three group matches, the third highest total of all the teams in Brazil, with only the Netherlands (10) and Colombia (nine) more prolific. One of the main reasons for France's progression as Group E winners has been the form of Real Madrid forward Karim Benzema, who has scored three times and set up another two goals. Benzema, 26, has netted nine goals in his last nine appearances for France having failed to score at both the 2010 World Cup and Euro 2012. If Nigeria are to progress, they are likely to need a good performance from goalkeeper Vincent Enyeama, a man well known to Les Bleus supporters. Enyeama, 31, helped Lille finish third in Ligue 1 in 2013-14 and kept 21 clean sheets in 38 league matches, including a run of 11 successive games without conceding a goal. In Brazil, he was not beaten in Nigeria's opening two games - a 0-0 draw against Iran and a 1-0 win over Bosnia-Hercegovina, although he conceded three in his country's 3-2 loss to a Lionel Messi-inspired Argentina. France have lost two of their last three World Cup matches against African nations (2002 v Senegal and 2010 v South Africa). They beat Togo between these two defeats, in 2006. Nigeria are aiming to become just the fourth African side to make the quarter-finals of a World Cup tournament (after Cameroon in 1990, Senegal in 2002 and Ghana in 2010). All of France's goals at this World Cup have come from inside the penalty area. Nigeria have only won one of their last 11 World Cup matches. Germany have lost both of their previous meetings with Algeria, scoring once and conceding four times. 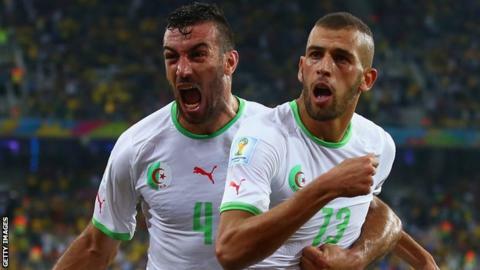 Algeria are the sixth African team to reach the knockout stages of a World Cup (after Morocco, Cameroon, Senegal, Nigeria and Ghana). Joachim Low's Germany attempted 1,999 passes (including crosses and corners) in the group stage, more than any other side. Algeria's six goals have been scored by five players. Only Colombia (six) had more scorers during the group stages of the World Cup than Algeria. Germany will be looking to reach the quarter-finals of the World Cup for the 16th consecutive tournament as they bid to win the trophy for the fourth time. And it was on this day in 1954 that West Germany equalled the record for the biggest ever semi-final win when they beat Austria 6-1 on the way to their first World Cup triumph in Switzerland. The margin has only been achieved in the semi-finals at one other World Cup - the first tournament in Uruguay in 1930, when the hosts' victory over Yugoslavia and Argentina's over the USA ended in the same 6-1 scoreline. The 1954 final saw West Germany rally from two goals down to beat much-fancied Hungary 3-2 in a match that became known in Germany as the 'Miracle of Bern'. Germany have won the tournament twice since and have lost four more finals. Named after a Brazilian football idol, the Estadio Nacional Mane Garrincha is right in the centre of capital city Brasilia. The stadium will host more games than any other at the 2014 World Cup, with seven matches in total being played there, including today's between France and Nigeria. The building has been completely redesigned and constructed with sustainability in mind. It is expected to become the first stadium in the world to be awarded platinum status from the US Green Building Council, which rewards sustainable construction. However, since Brasilia is not particularly known for its football, critics say the stadium - named after Garrincha, the right winger who played for Brazil 50 times and helped his country win the World Cup in 1958 and 1962 - is likely to become a white elephant after the tournament. Local authorities insist they will avoid that fate by renting the space out for concerts and other events. For the best of BBC Sport's in-depth content and analysis, go to our features and video page.